Be the first to share your favorite memory, photo or story of Theresa. This memorial page is dedicated for family, friends and future generations to celebrate the life of their loved one. 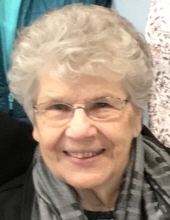 Theresa Victoria Prendergast, 87, of Mansfield, OH, previously from Bellevue, OH, died peacefully at her home surrounded by her family after her battle with cancer on Monday, February 18, 2019. Theresa was born on March 8, 1931 in Willard, OH to Karl and Lucille Samuelson Schlotterer. She married Thomas J Prendergast in Willard, OH, November 4, 1950. While being a stay-at-home mom, Theresa worked several jobs outside the home over the years. Being a mother was her most rewarding role. She volunteered many years at St. Peter's Catholic Church. She helped run Bingo games for different charitable organizations. Her first love was caring for and spending time with her family. She loved playing cards, watching sports with the grandkids, and an occasional gambling trip. Thanksgiving and Christmas holidays were a highlight of her year and she cherished family reunion vacations. Theresa loved, and looked forward to her four-hour coffee breaks at Denny's with Carol and Lenore. She is survived by her children Mary Ware of Norwalk, OH; Peg (Shannon) Prendergast of Kansas City, MO; Tom (Karen) Prendergast of Lenoir City, TN; Pat Prendergast of Mansfield, OH; Bunnie (John) Knapp of Lawrenceville, GA; Jeff (Donna) Prendergast of Mansfield, OH; Joan (Bill) Hardman of Mansfield OH. ; Beth (John) Deutschmann of Tamarac, FL; Brian Prendergast of Mansfield, OH; Shawn (Janet) Prendergast of Ft. Wayne, IN; 27 grandchildren; 15 great grandchildren; two sisters, Lucille King and Carol Schriner; many nieces; nephews; and beloved extended family members. She was preceded in death by her husband, Thomas J Prendergast; daughter, Kathy Prendergast; son, Mike Prendergast; one great grandson; one great-great granddaughter; parents, Karl and Lucille Schlotterer; seven brothers and six sisters. Friends and family may call at Herlihy-Chambers Funeral Home, 173 Park Avenue West, on Friday, February 22, from 5:00 to 7:00 p.m., followed by a short prayer vigil. Mass of Christian Burial will be celebrated on Saturday, at 9:30 a.m. at St. Peter's Catholic Church, 60 S. Mulberry St., Mansfield, with Fr. Austin Ammanniti officiating. Burial will follow in Mansfield Catholic Cemetery. In lieu of flowers, the family has requested that memorial contributions, if desired, be made to the Msgr. Edward C. Dunn Foundation for Education, 104 West First St., Mansfield, OH 44902; or to Med/Central/Mansfield Hospice, 335 Glessner Ave., Mansfield, OH 44903. To send flowers or a remembrance gift to the family of Theresa V. Prendergast, please visit our Tribute Store. "Email Address" would like to share the life celebration of Theresa V. Prendergast. Click on the "link" to go to share a favorite memory or leave a condolence message for the family.